You want to buy a new road bike or mountain bike at a favourable price? The full range of selections the manufacturers can offer? Welcome in our bike shop! It is not uncommon anymore to buy a bike online, since that way one has the chance to compare great offers and to profit from the variety for every terrain und for any budget. 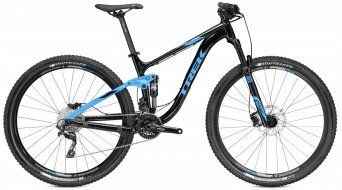 Whether bicycles at a favourable price for beginners or an expensive luxury bike with an exclusive equipment, on the one hand, you can profit from our favourable prices, on the other hand, you'll find the top bicycle brands of the industry in one place:Trek, Specialized, Ghost, Bergamont, Cervélo, Lapierre and many more! You can make use of the Trusted Shops buyer-protection and you'll have the option to buy your new dream bike and get financing (only for German residents). And (in Germany) we delivery bicycles free of shipping costs! Here, we offer you decision-making assistance if you are not yet sure as to which bicycle is the right one for you, and we would like to briefly show you the differences. In every category, you will discover detailed information on the respective bicycle type. Find the bicycle which best suits you. Not everyone feels comfortable amid fast cars on the asphalt. In order to limit the selection of bicycle types, first answer for yourself the basic question whether you are interested in a road bike or a trail worthy bike. We have classified categories, such as BMX and dirtbikes as "special". The 20 inch (BMX) and 26 inch (dirt) bikes are meant for small and big tricks, both designed for technical sports. Very stable and suitable for jumps and pump track operations. Contrary to them, a singlespeed track bike looks a little common, but only until one has taken a closer look: Because singlespeed bikes do not need any gearing system, and youalso need an affinity in order to tackle mountains and valleys with great will and vigour (without any gears). Singlespeed bikes are their own type and they also celebrate that. There are sportive cyclists for whom it is more of a hobby to go kilometre by kilometre by bike 3-5 times a week. The training and an increase in performance are paramount for them. They place the emphasis on frame materials, such as light carbon materials, the equipment with lightweight parts and high-quality, reliable components. Many mountain bikers who love the competition and who are into light, fast 29 inch hardtails, find themselves on a road bike after a certain time. Provided that one loves the road as much as one loves the dirt. The sitting posture on an MTB designed for races, is as flat as possible, and this applies even more to road bikes. There are also hobby cyclists for whom leisurely rounds are more attractive. Whether family round for which a hybrid bike is sufficient or the hobby mountain biker, to whom a reliable full suspension bike is important for comfortable MTB rides. The price-performance ratio will have a different emphasis in each respective case. These biker types place less emphasis on highly polished attachments, lightweight parts and aerodynamics, they are thus completely satisfied with bike models at a more favourable price. The more sportive leisure time cyclists will have a slightly different, more ambitious opinion on that subject. They make their round on the bike 1-2 times a week since they want to maintain their sportive fitness, enjoy the tour with friends or sometimes can also get enthusiastic about marathon or a bike tour trip - even if they do not want to come out as winners. They love the nature, the experience of cycling, and they place emphasis on an acceptable equipment, but not at any price.